The shoddy construction of the pipeline has increased concern for some landowners along the route. For many Texans, their land is their sanctuary and the thought of a spill on their property would be devastating. One such landowner is Lamar County farmer Julia Trigg Crawford. Julia Trigg is the manager of her families Red’Arc Farm, and has been battling TransCanada in the courts over eminent domain abuse for more than three years. The Texas Supreme Court recently ruled in Julia Trigg’s favor, ordering TransCanada to respond to her appeal by Feb. 6 as the justices weigh arguments to hear her case. Dilbit spills are devastating for communities, land and water. The 2010 Enbridge pipeline spill in Kalamazoo, Michigan sent one million gallons of highly acidic, corrosive bitumen into the Kalamazoo River and cost at least $850 million, more than any other onshore spill in U.S. history. Analysis from the Mayflower, Ark., tar sands spill last March reported 30 toxins – including ammonia, benzene, cyanide, phenols, toluene, polycyclic aromatic hydrocarbons, arsenic, copper, sulphate and chloride. The Gulf Coast Project crosses 631 waterways in Texas and a leak could affect the water supplies of millions of people. Gulf Coast refineries have become a prime target for tar sands refining. Many refineries have rejiggered their facilities to process the heavy oil coming from Alberta. The communities that live across the fence from Gulf Coast refineries, the end of the line for Keystone XL South, are primarily Latino and African-American. These communities are suffering disproportionately from the affects of carcinogenic emissions, making it a textbook case of environmental racism. The community of Manchester, the oldest neighborhood in Houston, is nearly 90% Latino and one-third of the residents fall below the federal poverty level. In addition to being oldest neighborhood Houston, Manchester is also the most toxic. A study convened by the Institute for Health Policy at the University of Texas School of Public Health, titled “A Closer Look at Air Pollution in Houston: Identifying Priority Health Risks,” identified seven pollutants that pose a definite risk to health in the community of Manchester. The report goes on to say, “In sum, East Houston neighborhoods that face a number of vulnerabilities based on their marginal social and economic standing also carry a heavier burden of health risks from breathing pollutants in their air.” Manchester is nearly surrounded by industry on all sides, including a Valero and Lyondell Basell refinery, and is situated along the Houston Ship Channel. Researchers have found that “children who live within two miles of the Houston Ship Channel have a 56 percent greater chance of getting leukemia than children living elsewhere.” In anticipation for Keystone XL, Lyondell Basell has more than doubled their tar sands bitumen refining capacity to 175,000 barrels per day. 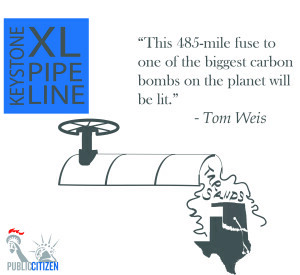 Port Arthur is the other destination for Keystone XL South. This small city is home to a pet-coke facility, chemical plants, and a handful of refineries – including the largest oil refinery in the U.S., Motiva. These refineries spew toxic emissions laden with VOCs (Volatile Organic Compounds) into the air near neighborhoods and the community of West Port Arthur. West Port Arthur is a mainly African-American community and it is situated between the Motiva and Valero refineries. Residents have nicknamed Port Arthur ‘toxic city.’ There is no doubt that these refineries bring jobs, in an otherwise desolate town, but they also bring asthma and cancer to those living next door. These two communities have become ‘sacrifice zones’ for tar sands refining, and spill or no spill, they will bear the burden of the refining process.